Sizzling scores in scorching temperatures! 120 ladies coped well in their 18 hole medal round as the thermometer hit 30 degrees C.
Competition Secretary Sue Johns and Lady Captain Beverley were at the desk ready to welcome entrants from 8.00 a.m. until 3.00 p.m. The course took on a different look as the 9 hole Badminton Course was included in the 18 holes for the Competition, thus eliminating the infamous watery 16th hole! It was evident from quite early on that the now familiar scorched course and fast running conditions would lead to a plethora of low scores and there were numerous enquiries at the desk as to "how will this affect my handicap?" The Kendleshire were excellent hosts throughout the day and Sue had plenty of help from County Delegate Rachel Scrase as well as the ladies and gentlemen of the Club with scoring, starting and ball spotting. 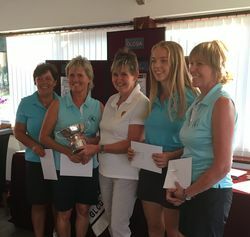 President Sue Rawles was delighted to be able to present the trophy to the winning team from her own Club, Tewkesbury Park. Sue went on to thank Sue Johns for her excellent running of the Competition, she thanked everyone for playing and hoped they would continue to support the County in this way.